Treasure Trail Progressive Jackpot Slot Review - Casino Answers! Treasure Trail is a 3-reel, 1-line progressive jackpot slot, featuring a wild symbol, multipliers and a progressive jackpot. You can play the Treasure Trail classic slot machine at Bovada. The coin value is fixed at $1.25 per spin on the Treasure Trail slot machine. You can use the “Bet One” button to select 1, 2 or 3 coins per spin. You can bet up to the maximum bet of $3.75 on Treasure Trail. Casino Answers strongly recommends that you play the 3-coin maximum bet at all times on Treasure Trail in order to remain eligible for its progressive jackpot. To play Treasure Trail, press the “Spin Reels” or “Bet Max” buttons. The main feature of the Treasure Trail slot game is its progressive jackpot, which is presently sitting at a rather large $442,513.60. To win the entire progressive jackpot, you must land 3 X symbols on a maximum bet spin. You can still win smaller amounts by playing 1 or 2 coins. You can find your way through the treasure trail to the big red X when you play this progressive slot at Bovada! There are 9 winning combinations on the Treasure Trail classic slot machine. The complete payout schedule is as follows (1/2/3 coin payouts in parenthesis): 1 Seven symbol (2/4/6), 2 Seven symbols (3/6/9), any 3 Bar symbols (4/8/12), 3 Seven symbols (10/20/30), 3 Single Bar symbols (15/30/45), 3 Double Bar symbols (20/40/60), 3 Triple Bar symbols (25/50/75), 3 Treasure Chest symbols (30/60/90) and 3 X symbols (15%/25%/100% jackpot). Hit “Autoplay” to open up the Treasure Trail autoplay mode where you can select the number of spins (5, 10, 25, 50, 100, 250 or 500) and number of seconds between spins (0, 0.25, 0.50, 1, 1.50 and 2). Stop settings are stop once all spins are complete, stop when jackpot is won, stop if a win exceeds or equals ($50, $100, $150, $200 or $250), stop on any win and stop if credits increase/decrease by ($50, $100, $150, $200 or $250). You can cancel autoplay on the Treasure Trail online slot at any time. 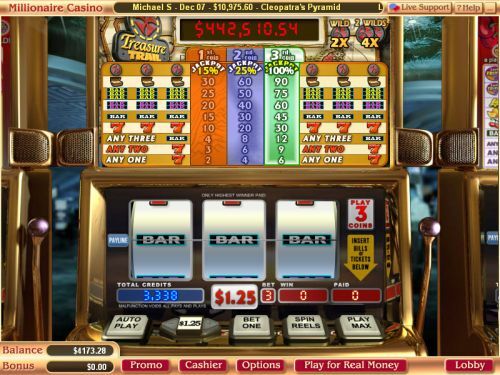 Treasure Trail offers a tremendous progressive jackpot at a relatively low cost. For a mere $3.75 per spin, you can potentially find your own personal treasure simply by spinning the reels. You can play the Treasure Trail progressive jackpot slot machine when you sign up and make a real money deposit at Bovada! Can I play the Treasure Trail progressive slot for free in practice mode? No, you can only play the Treasure Trail progressive jackpot slot for real money. If you want to play Treasure Trail, you must make a deposit at a Vegas Tech casino such as Bovada. Are American players able to play the Treasure Trail classic slot game? Yes, players who are based in the United States are welcome to play the USA-friendly Treasure Trail progressive jackpot slot. Do I need to download any casino software to play the Treasure Trail slot game? No, you can play Treasure Trail in your browser for real money. Simply visit Bovada and choose the Instant Play casino option. If you experience any issues with the flash casino, try installing the latest version of Adobe Flash Player.